Some advertisers used the TV-social media connection in a different way on Super Bowl Sunday when the lights went out at the Superdome in New Orleans. Audi, Walgreens and Oreo were just three brands that engaged in “newsjacking,” as it is called in marketing; all quickly issued tweets that used the blackout to help get their marketing messages across. Walgreen’s tweet: “We also sell candles,” followed by the #SuperBowl hashtag. Oreo was able to design an ad showing a cookie in shadow. “You can still dunk in the dark,” the ad said. “Broadcast media companies — and as we saw with Oreo’s Blackout Jack during the Super Bowl this past Sunday — know that Twitter is where viewers go to interact with other viewers around content in real time. So Twitter has grown into a primary engagement channel for broadcast media,” Greg Verdino, marketing strategist and founder ofVerdino, told the E-Commerce Times. It?? ?s not too late for yet one more 2012 year-in-review report, and today?? ?s latest addition comes from Nielsen, which examined how Americans have been consuming content over the course of the past year. The report found that of the 289 million U.S. TV owners, 119 million own four or more television sets, making TV still the device to beat when it comes to watching and recording programs, among other things. The TV owning audience can also be further split up by how they access their programing and what sort of things they use their TV for, besides live viewing. The disaggregation of linear TV is accelerating??? I was just talking yesterday about two French ISPs having given up on building their own linear content packages. One might argue that they did this in part because they see linear TV on a downward slope. The news last night about the Disney / Netflix deal will probably comfort them in that line of reasoning??? Earlier this year it looked like Netflix was facing an increasingly uphill battle to maintain its rich content at such a low price to consumers, and some of the large majors seemed to be poised to bet on cable as opposed to Netflix. But last night Disney and Netflix announced a multi-year agreement for Netflix to distribute Disney movies in the earliest Pay TV slot on their US platform. Of course, we have no idea what the financial aspects of the deal are, and whether in the long term such deals will drive Netflix?? ?s costs (and therefore their prices) up. Still, it certainly puts a halt to rumours that Netflix would not be able to negociate access to such contents. 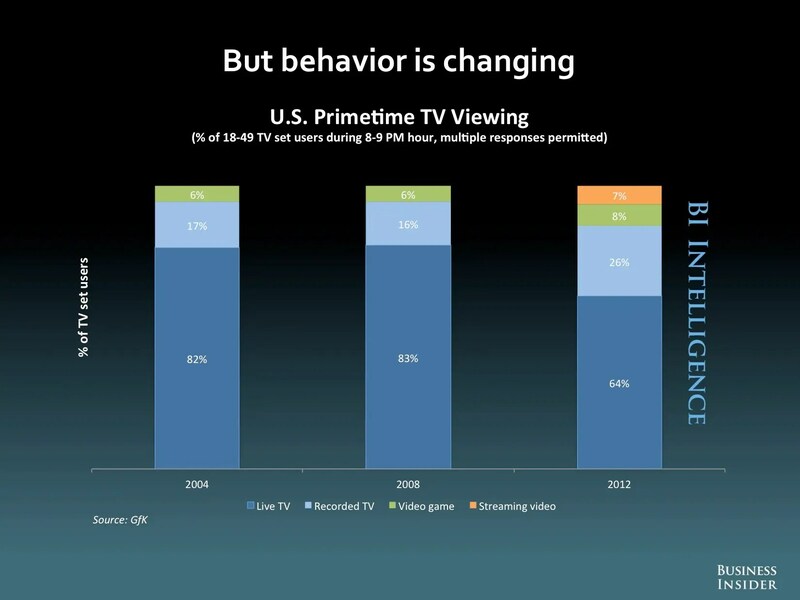 And as the slide above shows, 16% of US TV sets were used at prime time for non-linear video viewing 4 years ago, it?? ?s now 33%. Maybe Disney sees the writing on the wall as well. Linear TV is not the future of the Internet. Aereo, a bold bid to transmit television via broadband using tiny off-site antennas, won a major victory in federal court Wednesday when a judge denied the plaintiffs??? demand for a preliminary injunction blocking the service from allowing timeshifting during a live broadcast. The judge found that Aereo?? ?s method of enabling individuals to control viewing and recording from their PCs or mobile devices was covered by an earlier appellate decision. Oh noes! Free to air appointment television teeters on the brink.